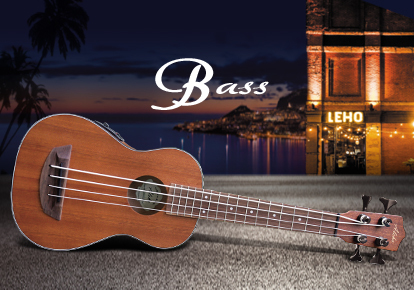 LEHO brings critical musician’s its first true ukulele bass as an addition to the “ALEHO” logo, all-laminated-sapele family. With robust and comfortable bass tuners, bass string spacing on a bari-sized body, a 3-band Mings preamp with broad and rich output; and an onboard tuner. Enjoy loads of nice solid “bottom” with or without an amplifier.